WASHINGTON—Anita Miller used to drive by the payday loan stores that littered the neighborhoods on her way to work and she pitied the people who had to use their services. As she goes without her federal government check for the second time, she now understands why people use them. President Trump and congressional lawmakers reached a tentative deal Jan. 25 to re-open the government for three weeks, but people are still worried. “I never thought I would be thinking about going to a payday loan shop,” she told The Final Call. “I’m not even sure they will give me money because I don’t know when I will get my next check but it’s worth a try. Things are just that bad. I know the interest rates are high. I know this will put me further in debt but right now I need some relief,” she explained. “I always thought having a government job meant stability and consistency. Never in my wildest dreams would I have thought that the government would be shut down all these days. It just brings tears to my eyes talking about it,” said Ms. Miller. The shutdown was hard for families and “payday loan companies are real options,” she continued. Predatory lending companies including payday loan and car title lending companies that many families would have never given a second look at are now becoming viable options during the longest partial government shutdown in U.S. history. According to a recent online report by Zillow Research, unpaid federal workers already owe as much as $438 million in mortgage and rent payments this month. The Center for Responsible Lending (CRL) strongly cautions those workers struggling to pay their rent or mortgages against taking out payday loans or other predatory products that carry high annual interest rates of up to 400 percent. They contend workers should be able to seek a forbearance from their lender until they resume work and should also ask lenders not to report them as delinquent during this period. Furthermore, workers may want to consider looking to banks and credit unions that are offering low-interest or zero percent interest loans during the government shutdown if they are in need. “Predatory payday lenders may see this as a profitable opportunity to take advantage of government employees and contractors who are not currently receiving a paycheck to cover their rent, mortgage or bills. 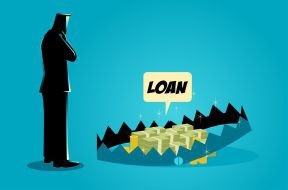 People are better off talking with their local bank or credit union to see if they qualify for a zero percent interest loan, as many financial institutions have already begun offering such options,” said CRL Executive Vice President Debbie Goldstein in a statement. The crisis is not just for people who owe rent and mortgage payments. “If the shutdown persists, the Department of Housing and Urban Development (HUD) could also run out of its reserves to renew programs that fund rental housing assistance, which would hit vulnerable communities the hardest,” Ms. Goldstein said. “The government shutdown over the funding of a border wall is divisive, unnecessary, and it’s hurting the American people, particularly lower-income families and communities of color,” she added. Even with a tentative deal reached to reopen the government at least temporarily, people affected will still have to catch up on bills they may have fallen behind on. “Payday lenders are also notorious for targeting consumers of color, which widens the racial wealth gap within our communities,” explained CRL California Policy Director Graciela Aponte-Diaz.